While there are thousands of collectors looking for specific rare coins, the main focus in today’s market remains in bullion related coins. 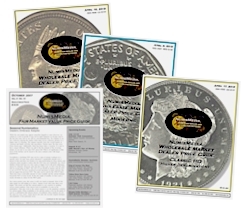 The U.S. Mint sold out of the 2015 $100 Proof Platinum coin in less than five minutes this past Thursday and the after-market is quite intense with premiums as much as $500 over issue price. The Teletypes and Houston Money Show were mostly about bullion and Friday saw the metals stage a rally that has attracted buyers into the market. Nevertheless, the main attraction in Houston was the Heritage Auctions Signature Sale. The $5 Gold Indian series was a focal point with several great rarities being offered. The key date in this series is the 1909 O which always attracts lots of aggressive bidding. The coin available was certified by PCGS as MS62 along with the CAC approval; it brought $56,400. But likely the most significant attraction was the 1915 S $5 Indian in PCGS MS64 CAC. This sold for $94,000, slightly more than our current MS65 Market price, and at least a couple of potential buyers thought it might upgrade. Below are some of the other highlights from Heritage Auctions. 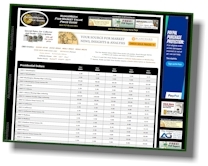 Changes throughout the HD Wholesale Market Dealer Price Guide are rather sparse in Half Dollars through Dollars. However, Walking Liberty Halves did show an abundance of adjustments for some of the higher grades in MS65 and above. In the early dates the Market is higher for the 1916 D in MS66 at $3,725 and the 1917 S Obverse in MS65 is up to $17,650. Also advancing is the 1929 S in MS66, now at $4,750. Many of the later Walker dates after 1937 have turned down slightly in MS65 and higher because of the excessive inventory available in the market.